Ed Miliband’s claims that David Cameron and other European leaders failed Libya and in part contributed to the migrant boat catastrophe in which 800 people drowned were branded “shameful and absolutely unacceptable” by Number 10. The Labour leader, who has not yet given the speech, plans to say world leaders have not supported Libya in the wake of coalition airstrikes, which contributed to the downfall of Colonel Gaddafi, leading to growing numbers of migrants dying in the Mediterranean. Despite having voted in favor of military action against Libya, Miliband will say there were “failures in post-conflict planning.” He will say the refugee situation could have been anticipated. 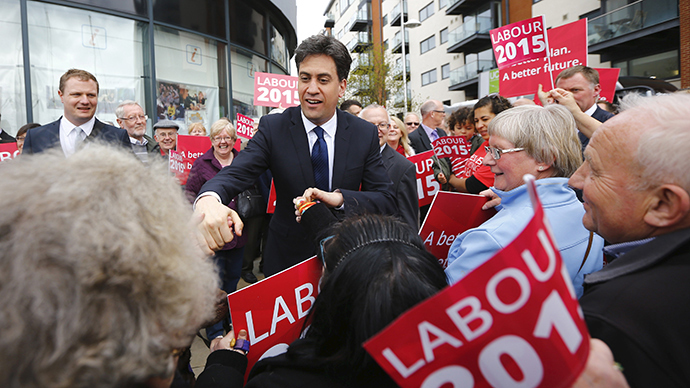 “In Libya, Labour supported military action to avoid the slaughter Gaddafi threatened in Benghazi,” Miliband will say. His comments echo those of UKIP leader Nigel Farage, who said on Monday that EU leaders were responsible for the deaths of the migrants, suggesting airstrikes had de-stabilized the country and forced more migrants to flee. The airstrikes carried out in 2011 by a UN-authorized coalition of France, the UK and the US saw Colonel Gaddafi’s regime collapse. The country has since been plagued by political insecurity, with no single functioning government. Since the toppling of Gaddafi, a civil war between tribal militias throughout the country has ensued. The Conservatives responded with anger, with Environment Secretary Liz Truss saying the remarks should be withdrawn. She said Miliband’s comments were not the way current affairs should be discussed. Shadow Foreign Secretary Douglas Alexander, however, said the speech was not intended to create public argument, blaming Number 10 for fabricating the row. Alexander insisted “the state of Libya is a failure for postwar conflict-planning for which the international community faces responsibility. “I don’t think anyone disputes that we are witnessing a situation where Libya is perilously close to becoming a completely failed state on the southern shores of the Mediterranean. That is not a matter of dispute; that is simply a matter of fact,” he said. Miliband will make a rare foray into foreign affairs in a speech at Chatham House on Friday, which is unusual for any politician during election campaign season. He is expected to say that Cameron’s discourse on an EU referendum has given the world the impression the UK is slowly isolating itself from international affairs.